I have included this as a separate section because in my experience it is one of the hardest concepts for engravers to understand. The central idea is this: once the cutter is installed into the spindle, it remains fixed. For some unknown reason, most people think that the cutter is moving up or down in the spindle. Wrong! The only things moving are the micrometer and nosecone assembly. Depth control is achieved by screwing the micrometer (with nosecone attached), up or down on the spindle housing. 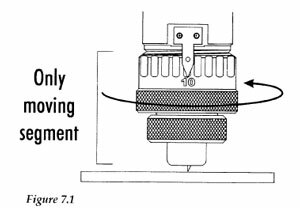 (See Figure 7.1) The cutter never moves unless you set the depth by loosening the tiny spline screw found in the cutter knob. Not my first choice for good depth control. Confused? Try this test. Remove the micrometer and nosecone assembly completely and insert a cutter. Now try to change the depth. Without the micrometer, the only way to move the cutter up and down would be to loosen the spline screw in the cutter knob. Depth control would be nothing more than guesswork. When the cutter is installed into a spindle that has a micrometer depth will be controlled by rotating the micrometer clockwise or counter-clockwise as required. This action exposes more or less of the cutter with each turn. 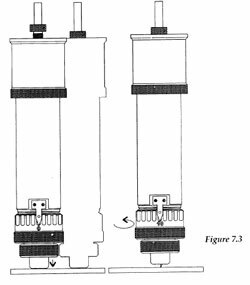 (See Figure 7.2). To remove the guesswork in setting the "proper" depth, we must first "zero" the cutter. Zeroing the cutter allows us to know our starting point and all changes after that can be managed. Once you grasp this idea, the rest is easy. CAUTION: When you loosen the set-screw in this step, the cutter may fall out of the spindle and a broken tip is possible. Use one hand to hold the cutter before loosening. With the appropriate cutter installed in the spindle, loosen the spline screw in the brass cutter knob with a spline wrench, more commonly referred to as the cutter wrench. Gently place a piece of metal (brass preferred) against the nose-cone so as to push the cutter even with the bottom of the nosecone. Now the cutter should be flush with the nosecone. Tighten the spline screw. The spindle is zeroed and you're now ready to set the cutting depth. To select the depth of cut, turn the micrometer to the right (counter-clockwise). Each click equals .001". Therefore, each complete rotation of the micrometer from 0 back to 0 equals .025”. Dial in the depth that will cut through the cap layer to sufficiently expose the core plastic, usually .003" to .012". If you've purchased a collet spindle be sure you feel comfortable with the above process for normal depth setting. You cannot burnish using an adapter if you have a split collet. The collet would grab the cutter and it could not float in the spindle shaft. If you want to use a split collet to hold a top-load cutter, an extra step must be done to insure proper set-up. It's a little tricky for the following reason: When a cutter is inserted into the collet spindle, the draw-bar is loose and the collet is not fully seated. Upon tightening, the collet will be drawn into the spindle shaft and the cutter will be drawn up as well. If you insert the cutter into the draw-bar and do not loosen the brass cutter knob spline screw first, you cannot let the cutter be drawn into the spindle and will never get the draw-bar and collet tight. Letter quality will suffer and the cutter or collet may come loose during engraving. Load the cutter from the top with the draw-bar loose. Loosen the brass cutter knob spline screw. Tighten up the draw-bar to capture the cutter in the collet. Retighten the brass cutter knob spline screw. You are now holding the cutter by both the collet on the bottom and the cutter knob on the top. This is a good set-up and will result in good letter quality. Remember that any time you tighten the draw-bar you draw the cutter up into the spindle. If you use the standard method for zeroing the cutter you will think that the cutter is flush with the nosecone, but the act of tightening the draw-bar has changed the physical location of the cutter by a few thousandths of an inch. When you start the job, you will be surprised to find that the cutter was up inside the nosecone and you did not even break the surface regardless of the depth you dialed in on the micrometer. Do your best to set-up using the normal zeroing method. At least the cutter will be within a few thousandths from zero. Carefully place a piece of scrap brass under the nosecone and turn the micrometer counter-clockwise until you can just scratch the plate. When you do scratch the plate, back it off .001" and call that zero, your new starting point. Your micrometer will not be set at zero and you will need to note where it is in order to set the desired depth later. The reason I recommend brass is so that I can easily see the scratch and avoid breaking a fine cutter tip. This isn’t an elegant approach but it’s quite effective and allows for the use of the micrometer to set the depth reasonably accurately. As long as you know where the micrometer was located when you determined you had zeroed the cutter you can add the proper depth by counting the clicks of the micrometer. I only mention setting up your plate at this point to remind new engraver operators that properly securing the work piece will ensure better results. I've made the mistake of having all other set up procedure down pat only to forget to tie my work to the table. For some strange reason we miss the obvious. Every, and I do mean every engraver has cut into their engraving table. This is usually a result of having the material move during the process. Check and double check this step whether you use a work holding vise or tape. When the object moves, it will probably be scrap. New products are available to help keep material down on your engraving table, Fat-Mat and Seklema. It's finally time to explore each engraving technique in its proper detail.